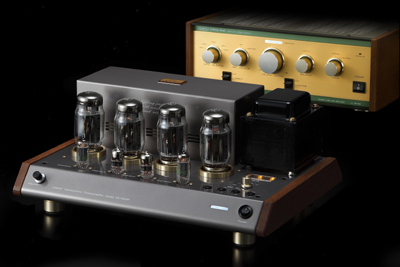 Leben Hi-Fi Stereo Company is a Japanese manufacturer of tube amplification. He is also a collector of premium tubes such as 3CSS, 12AT7, E288CC, 6L6GC (5881), all of which are (will be) used in Leben amplifiers at their best capabilities based on Leben's technology. Mr. Hyodo left Luxman and established his own "Kouri Denki Co."(production of electric/electronic components, parts & PCBs) in 1979 when he was 30 years old. Besides producing electronic components and parts, he also has been continuing production of amplifiers under "KFH" brand name mainly for private requirements from Cafe bars, restaurants, etc. The first commercial based product "TRIODE 33"(under "KFH" brand) was released in 1991 with very premium tube 3C33, and a first model under “Leben” brand was a power amplifier RS-35a (with 6L6GC) released in 1995, and then a preamplifier RS-28c (with E288CC) in 1998. (RS-28c was recently renewed as RS-28CX with G.E. 6CG7). His amplifiers are more of a product of passion, and not many models are produced, however, several people in Japan have actually gathered and set up a fan club called "Leben Audio Lovers’ Club". Members are always waiting for a new model from Leben, which amazes them each time. In light of these circumstances, Mr. Hyodo has started to produce lower-cost amplifiers such as CS-200, CS-250, CS-300, CS-300X to allow more music lovers a possibility to enjoy Leben’s tube sound without investing too much. All of the Leben products are hand made by well trained and experienced people, and are all beautifully finished with high quality components by point to point wiring. All products are still made in Japan, and Leben product’s owners can expect long life and high reliability as well as a highly musical and rewarding performance. All Leben products are based on “Self-biasing circuit”(even by sacrificing the output power on specification) in order to allow users to replace tubes without bias-adjustment and to continue stable operation.